Hank is a 2yo pup owned by a young family, who have had him since he was an 8 week old. Hank is very loved. He went everywhere with his family, and loved playing with dogs and kids. He got a commendation certificate for good behaviour at dog-school. He had never been impounded, or caused a problem in his community. Hank was involved in an incident where a child was injured. The injury is reported to have occurred at a friend's house, after Hank collided with a child, catching her lip on his tooth and causing her to need stitches. There was no malice - no bite - and all witnesses agree it was simply an unfortunate accident between a child and this clumsy, oversized pup. Hank was declared dangerous by council. Devoted to his care, his owners built a council-approved 'dangerous dog' enclosure. Hank's family complied with the conditions of the dangerous dog order for more than six months. But then council decided it had made an error and issued a destruction order for Hank. 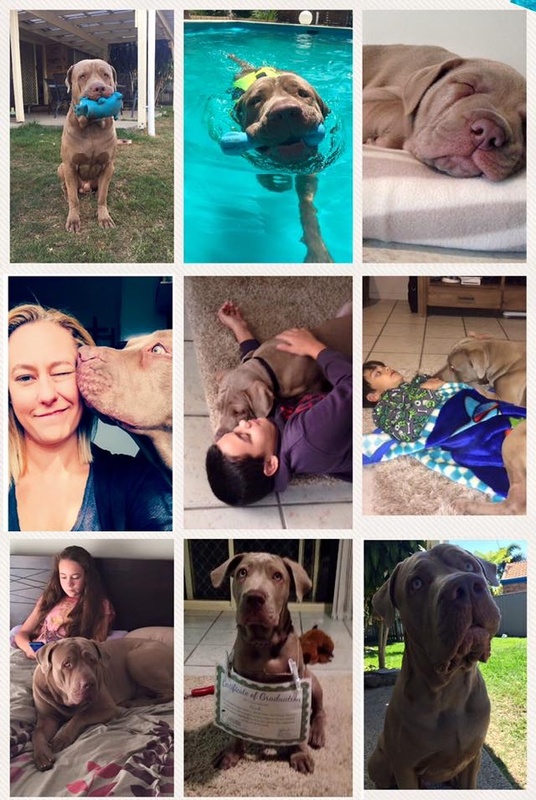 Hank was seized in May 2017. His owners are fighting the order to kill Hank in court in August. In the meantime, Hank is being held on behalf of council, at Dakabin RSPCA. What happens to a pet in the RSPCA's dog-jail? It is well documented the effect of extended kennelling on dogs. ".... confined in very small, barren cages that do not provide sufficient space for the animal. They may never be allowed out of the cage, leading to psychological and medical problems. Dogs and puppies are unable to express normal behaviours in such confinement (they have no space to exercise, play or explore) and this can lead to the development of repetitive behaviours, also called ‘stereotypies’, and other psychological problems. Repetitive behaviours are one the most serious indicators of long-term welfare problems and can include circling, excessive licking of paws, flanks or the cage and howling. Dogs in these situations can develop severe mental illness which can affect their ability to be re-homed. The bones and muscles of caged dogs are often weak and painful from the lack of space and exercise. Being confined also prevents dogs... from having opportunities to socialise with humans and other animals. Confining animals permanently in small cages means that they must eat, sleep, toilet... all in the same small area, causing great suffering and promoting infection and disease. ...A high incidence of viral, bacterial and fungal infections including canine distemper, hepatitis, parvovirus and kennel cough. These conditions can cause acute suffering and can also have chronic effects on the animals that survive the initial infection. But of course this is as it applies to puppy farm dogs. The RSPCA does not believe puppy farmers should be allowed to keep dogs in extended kennelling because of an implicit and scientific understanding that it is cruel. However, while puppy farmers confining dogs is deemed by the RSPCA as unacceptable, the report from Hank's owners show that the care being offered to him, is basically identical. "This was a well dog in a very good condition on entry to the pound. Hank remains in a cell where he can barely turn around, is wet all day and receives no sunshine. He has not been taken out for exercise. At times his owners are refused entry to visit him. He has contracted Kennel Cough, has infection in his paws and skin irritations." Unsurprisingly, Hank has kennel cough and injuries and swelling in his legs. He is sick. He is depressed. He is being held in an environment that is sub-standard for his welfare. And he's being exposed to the health and welfare implications of being held with the thousands of other animals being processed through Dakabin RSPCA annually. Neo's are known as a sensitive breed that needs their family to thrive. Young dogs need regular exercise to ensure proper development and large breeds are not finished growing until they are between three and four years of age. Hank is also in a critical socialisation period and is being robbed of his chance to continue to mature into a safe dog. Hank continues to be subjected to the known damages caused by extended kennelling. By the date of his court case, he will have been impounded for over 3 months. To continue to keep Hank in a pound is a cruel and unusual punishment. There is a Change petition calling for Hank to be treated humanely here. Please help give Hank a voice. Follow #hankslaw and the Save Hank FB page.